Get out your guns, bats, and chloroform. It's time to go rogue. 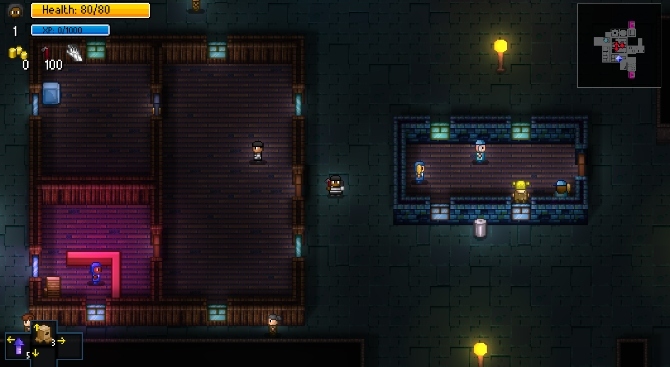 Streets of Rogue is a casual couch co-op game that puts an urban spin on dungeon crawling. In the age of online multiplayers, it’s becoming harder to find a decent couch co-op game. What happened to the days where you and a friend could plop yourselves in front of a TV to complete a game together? 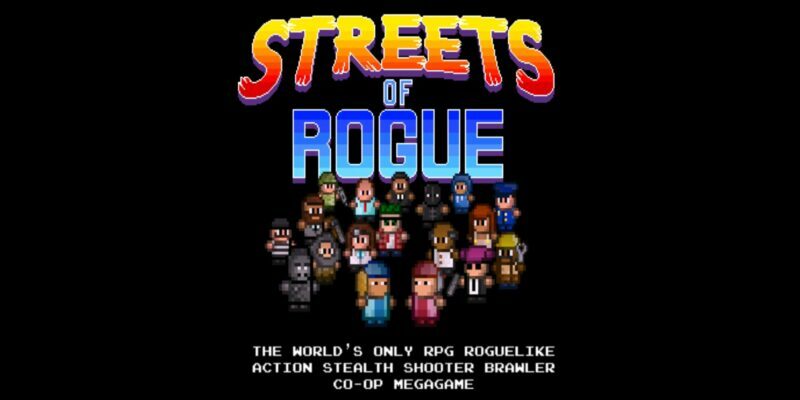 With Streets of Rogue, we can finally relive our couch co-op days. Although it also offers online multiplayer, I think it’s even more fun when you play locally. This top-down game is a blast to play with friends, and I’ll tell you why. 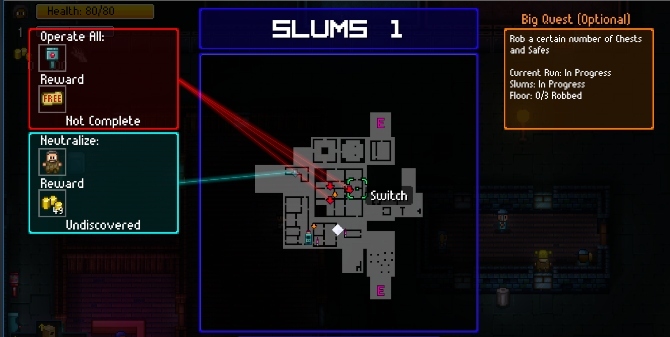 Predictability does not exist in Streets of Rogue. In each level, you’re thrown into a completely different map. You’ll never encounter the same level layout twice, even if you decide to start the game over. The game randomly generates maps as you progress, giving it high replay value. Maps come in the form of a small city—you can walk into houses, break into laboratories, and even stop to get a health-boosting drink at a bar. The members of the community don’t take kindly to violence, and won’t hesitate to shoot or brawl when you start throwing punches. There are three levels in each stage, and six stages in all. After you complete the three levels within the Slums stage, you move on to the Industrial stage. Later on, you’ll encounter the Park, Downtown, Uptown, and the Mayor Village. All stages have a distinct appearance. Each character has a different Big Quest during each level. For example, if you play as a thief, you’re responsible for stealing from a specific amount of safes and chests. You don’t necessarily have to complete your Big Quest to progress to the next level, but it’ll give you bonus XP and some chicken nuggets. You still have to abide by what the left side of your menu screen tells you to do. These smaller missions vary during each level. It could consist of anything from stealing from safes, hitting switches, killing a target, rescuing a prisoner, and more. The game constantly changes the smaller missions, so it never gets boring. In typical games, it’s easy to get tired of playing as the same characters over and over again. 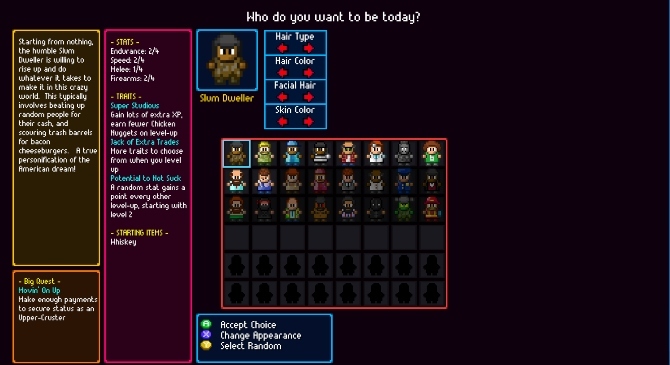 Fortunately, Streets of Rogue has over 20 unlockable characters with completely different stats and abilities. Play as the soldier, who comes equipped with tons of destructive weapons, or choose to assume the role of the doctor, who can put people to sleep with chloroform. You don’t even have to kill anyone to complete the game. The doctor, for example, is a pacifist and can’t use any weapons. Such versatility in character choice makes it exciting to play with three other friends. Some characters’ abilities complement each other perfectly—I’d say it’s definitely easier and faster (not to mention more fun) to complete the game alongside a friend. The game also features different endings—there’s a good and a bad ending. Since I don’t want to reveal any spoilers, I’ll just leave it at that. This game can quickly get frustrating if you’re too reckless. It becomes even more difficult if you play by yourself. If you die in the game, you have to start all over. And I don’t mean just start from the beginning of that level, you have to start from the beginning of the first stage. When playing with a friend, your partner in crime can revive you—for a price, of course. Your friend must sacrifice a certain amount of money or half of their life. Not only do you risk danger when fighting enemies, but you also risk your life by simply walking. Some buildings come outfitted with traps; stepping on a malevolent floor switch will have you instantly killed. In addition, you’ll also face occsasional radiation blasts, dropping bombs, killer robots, and zombie invasions. That being said, it’s not that easy to stay alive. When you die in single-player mode, there’s no coming back. You get to keep the characters you unlock, but it’s irritating to have to replay each stage all over again. 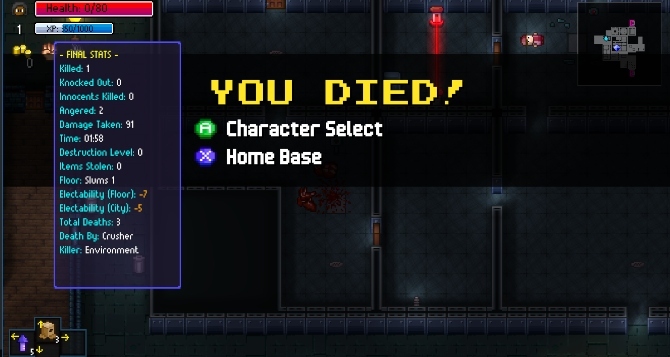 I guess that’s part of the game’s challenge factor, but I wish the developers created a way that you could get revived in single-player mode or at least added checkpoints. Health is also not readily available throughout the game. You can find some hidden in trash cans or refrigerators, however, it’s usually barely enough to keep you alive. You also have the option of buying health, which is also a problem—when you have no money and you’re on the verge of death, you’re virtually screwed. This game definitely isn’t your average dungeon crawler—it’s actually more of a “city crawler.” I’m impressed with the entire environment of the game, and the intelligent AI that never fails to violently chase after you. The game doesn’t have lifelike graphics, but it doesn’t matter. Streets of Rogue is still just as great (if not better) than an uber-realistic game. Many developers create shoddy retro-style games in an attempt to hop on the retro trend bandwagon, but you can tell that the developers put a ton of effort into Streets of Rogue. I’m also a fan of the synth-filled music that’s played throughout the game. 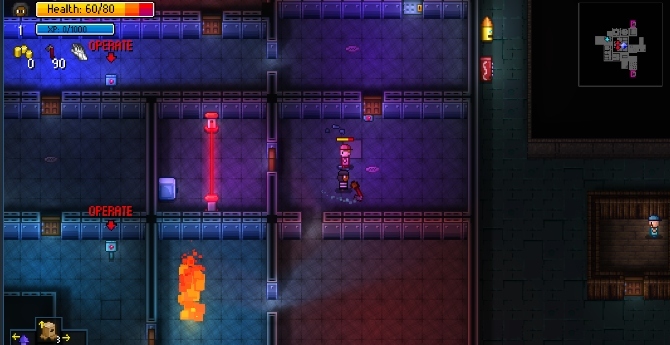 The soundtrack reminds me a bit of Hotline Miami, but with a distinct Streets of Rogue spin. The music never gets old—and that’s a good thing, since you’ll be stuck replaying it several times after you keep dying. If you want to take a break from top-down games, but still want to listen to awesome in-game music, check out our review of the platformer, Gunpoint. Emma is a staff writer at WhatNerd. In addition to being an avid writer and tech geek, she's a fan of games, anime, manga, and more. She's based in Connecticut.